After the death in 1723 of Antoni van Leeuwenhoek, the man who discovered microorganisms, it was over 150 years before microbiological research returned to Delft. Jacques van Marken, had opened his “Netherlands Gist en Spiritus Fabriek” (NG&SF) in the city in 1869. He was a man who was open to new ideas, so it is no surprise that with yeast as his main product, he decided that production could be improved if he employed someone who understood yeasts and bacteria. In 1884, he recruited a young botanist who was teaching at the Agricultural School in Wageningen called Martinus Willem Beijerinck to open the first industrial microbiology laboratory in the world. After a few years, Beijerinck became the first Professor of Microbiology at the Delft Technical College. The research carried out in the laboratory was a mixture of fundamental and applied microbiology. The Laboratory of Microbiology is now part of the Department of Biotechnology and the Delft Technical College is now Delft University of Technology, but Beijerinck would feel at home as they still understand the value of fundamental and applied science. When Beijerinck retired to Gorssel, he was succeeded as Professor of Microbiology by Albert Jan Kluyver. Kluyver’s Doctoral research had been supervised by one of Beijerinck’s previous students, Gerrit van Iterson, Delft’s Professor of Microscopic Anatomy and Applied Botany. Kluyver was not a trained microbiologist. His Doctoral thesis was about biochemical sugar determinations. This interest in (bio)chemical reactions was to stay with him and influence his work throughout his life. In his inaugural lecture as Professor, he emphasized the importance of cooperation with industry without neglecting fundamental science, and then took his own advice. Van Iterson approached things differently. His greatest interest was the combination of mathematics with biology. Today he is recognised as one of the pioneers of biomathematics, a subject at the heart of much biotechnological research. With support from Beijerinck, he founded the Delft Botanic Garden as a source of materials for study and research. One of Kluyver’s pupils, Cornelis Van Niel, introduced the phrase “Delft School of Microbiology” in 1949 but how people qualified as members was not clear. The Delft School is clearly important to many - a brief search of the internet reveals how many great microbiologists, worldwide, felt their links to Delft so strongly that it is mentioned in their obituaries. 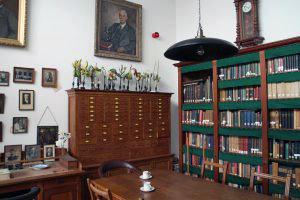 Many scientists who have never visited Delft use a sort of genealogical approach through their own supervisors and their supervisors to trace their scientific “ancestry” back to Martinus Beijerinck. When they do eventually visit Delft, they visit Van Leeuwenhoek’s grave and then talk of “coming home” when they visit the Beijerinck Museum. Perhaps a more scientific description that Beijerinck would recognise should include enthusiasm for general microbiology and a need to know how biological systems work, especially in ecology and physiology? Adapting an old proverb: From a tiny acorn planted in Delft, a mighty tree has grown!